On June 27, 2012, Venterra purchased Jefferson at Champions Parkway Apartments in Alpharetta, Georgia, located in North Fulton County, one of Atlanta’s most desirable and affluent submarkets. 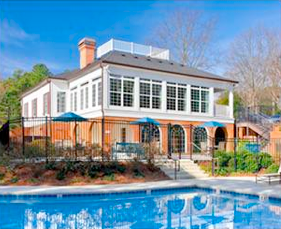 This 426-unit apartment community was constructed in 1989 and is in one of the metropolitan area’s most highly rated school districts and is surrounded by Atlanta’s concentration of country clubs and high-end neighborhoods. The property features a resort style pool with sundeck, fitness center, tennis courts, resident business center, laundry facility, playground, and pond. We look forward to making some amazing improvements to the apartment homes, including stainless-look appliances, faux granite countertops, nickel-brushed light fixtures and door hardware, faux wood flooring, goose-neck kitchen faucets and two-inch faux wood blinds. We also want to welcome our new team at Jefferson to the Venterra Family and we look forward to seeing great things from you in the near future!